He wrote this information down on the back of his “business card”—a small piece of paper with “Pure Window Cleaning” printed on one side—and handed it to us. Then he loaded up his hoses and drove on to his next job. That we were given expert culinary advice by a window washer is par for the course in Penzance, Cornwall, UK, a town filled with quirky charm and friendly people. We had escaped the nearly 100° temperatures of Girona and headed for southwest England. After a few days in Wells, Somerset, where we greeted our favorite cathedral, we participated in a heart-opening Deep Awakening workshop with Tim Freke in Glastonbury. Then we took the train to Penzance, partly to enjoy the cooler climate and partly to base ourselves in a city we enjoy, from which we could visit numerous powerful places and interesting sites in southwest Cornwall. Unfortunately, too many other people had the same idea, and it was nearly impossible for us to book accommodations for more than a few days at a time. Then our friend Emily, who concocts Pure Nuff Stuff (CLICK) cosmetics in the Egyptian House in Penzance, put us on to Chapel House—she knows the owner, who stocks Pure Nuff Stuff toiletries in the bathrooms. This luxe boutique hotel just opened a few months ago and isn’t listed on any of the standard booking sites. Chapel House (CLICK) is an historic building dating back to 1790, when Penzance was an important naval base for the Napoleonic wars and the principal port for shipments of tin and copper from the mines that made Cornwall famous. Susan Stuart, the proprietor, has completely refurbished the place while maintaining its historic charm. She showed us the different guestrooms, of which there are only 6. 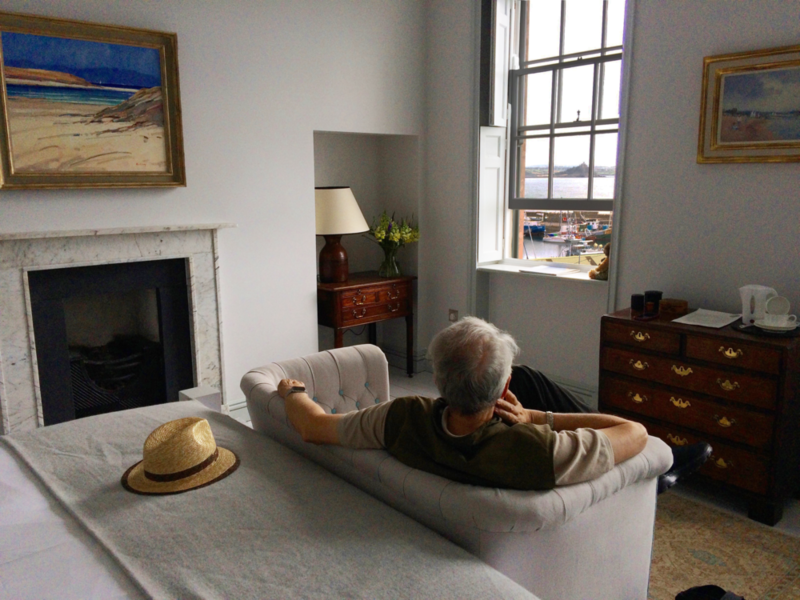 We chose Room One, which has a stunning view of St. Michael’s Mount across the bay. Every room is different and furnished in excellent taste—and has an iPad loaded with local information. Along with our room, we would have use of the gorgeous house—library, reception, gardens, kitchen, and dining room. Not bad, what? Susan provides more than a B&B—she also offers room service snacks and weekend “kitchen dinners,” with a choice of locally sourced seafood and vegetables. We had landed in something close to heaven. We negotiated a long enough stay to avoid the worst of the heat in Spain and long enough to rest and regroup after our whirlwind trip to the USA, during which we had disposed of the contents of our storage unit, put our Santa Fe house on the market, and visited kids and grandkids. So here we were, standing in front of Chapel House, looking for lunch. Following the window washer’s directions, we walked down a set of steep stairs to the harbor to the Old Lifeboat House Bistro. 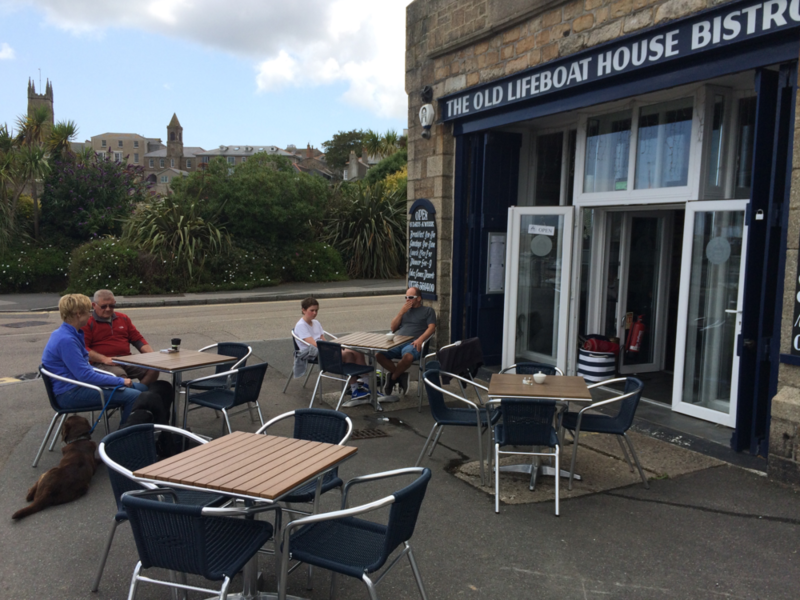 The small stone building is, indeed, the “Oldest lifeboat house in Cornwall.” Although it looks like a snack bar, it offers such delicacies as Tart au Citron and a Cornish Cheeseboard, as well as the expected Sticky Toffee Pudding. It is a local hangout and appears to be frequented by elderly women who are regulars. Our waitress sat down with one lady and had a short conversation about her new haircut before asking if she wanted her usual steak and fries. When a couple sat down outside with their dog, the waitress brought out a dog bowl and a jug of water for the dog before taking their order. “Wouldn’t want the dog to be uncomfortable, would we?” she said, when I asked. We looked at the chalkboard with the daily specials and chose the Newlyn Crab salad (caught near Newlyn—an arts colony/fishing town next to Penzance). It was delicious, complete with fresh salad and a grapefruit dressing. I spied a high-class Italian espresso machine behind the counter and a sign proudly announcing Carraro Fine Italian Coffee (since 1927), so we ordered macchiatos (espressos with a bit of foamed milk), which were nearly as good as the ones we get in Girona. Delightfully filled, we walked back to Chapel House to luxuriate in our swimming-pool-size tub for two, enhanced with some of Emily’s luscious Pure Nuff Stuff Squeaky Clean bath gel. It was just another day in Penzance—and the only pirates in sight were in the windows of the curio shops along the strand. Maybe that’s because they’ve been scared off by the prone plaster statue of Admiral Benbow with a rifle, poised on the rooftop of the pub with that same name on Chapel Street.